If you are into safe, effective movement, you will do well to meet George Bullis. George has been fascinated by the human body, human movement, and bio-mechanics for over 40 years. In his 20’s, he got a black belt in two martial arts. One was Taekwondo. The other was Hapkido – one of the most sophisticated and anatomically technical martial arts of them all. Hapkido often employs rapid and precise manipulation and leverage on human joints, nerve-lines, and pressure points. 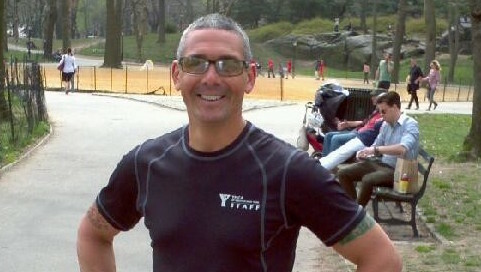 He taught unarmed defense to New Jersey police for a couple of decades.He has been an avid runner, studying running mechanics and training other runners, for over a decade now. He has an incredibly keen eye and mind for body mechanics, and a strong, spry body of his own that he experiments with. He sees the difference in peoples body, and trains to each individual. “one size does not fit all”. He also has a knack for delivering the useful elements of his knowledge to folks, in a way that they can use it immediately. It is great to watch him work with a client, even when the client is me. I recently invited him to critique my back squat. He was clear, compassionate, and spot-on in his delivery of two very precise bio-mechanical corrections, one of them at my deep-core level. Nerding out with him in conversation recently about deep-core muscles and bio-mechanics, I saw him light up and focus in with excitement, as I followed his description of his continuing education course called FAMI “Functional Anatomy for Movement and Injuries” at the Icahn School of Medicine at Mount Sinai Hospital in New York City. This highly respected immersion course includes cadaver labs, and in-depth study and practice of modern movement-based treatments for injury prevention and recovery. This is healing work in which the client participates, and learns how to fix or prevent their own injuries. Learning to fix your own body pains and hitches is very empowering! George not only loves this stuff, he has actually applied it again and again, with real patients/clients, to their great benefit. In conjunction with all of this, Pilates has been a big fitness focus of his for the last seven years. “this kind of practical deep -core training is invaluable once you are past 45 or 50” he told me recently. → What if your body felt vibrant?